After my previous posts on Office Politics I got some very interesting reactions from readers. Many of them included the same question: How to be good at Office Politics without getting into unnecessary conflicts? In order to answer this question, we have to understand why engaging in Politics leads to conflicts initially. The answer is pretty simple: in order to get a better slice of the cake we apply Political Power towards others who also want a slice of the same cake. Indiscriminately applying power to real people tends to cause resistance (because people don’t like being forced) and if this resistance is seen as non-legitimate – this is when conflict officially starts. So, in order to avoid conflict either the initial application of power or the resistance to it should be seen as legitimate by the involved parties. This quest for legitimacy could be much better understood through the distinction between Hard and Soft Power. It could be seen very clearly through some basic example from International Politics. For example, during the first half of Twentieth Century, Imperial Japan did its best to increase its status through force of arms. For some time, things actually went very well for Japan: it annexed Korea, beaten Imperial Russia, invaded China and expelled all European powers from South-East Asia. Of course, we all know it didn’t end very well for Japan in the end. And this is because after its every success, caused by a direct application of power, the resistance of other players (and there are always other players!) grew exponentially. However, in the second part of the same century, the status of Japan in the western world (its initial aim) began to grow even though Japan was defeated militarily. Instead of trying to be respected for its military power, it became an industrial and a cultural power. It became associated not with warships and mass genocide, but with Honda and Mitsubishi, Anime and Manga, Karate and Judo, Reiki and Shiatsu and many more. Opposite to what happened in the previous period, Westerners began copying from Japanese, started learning their language, wanted to tour and live in Japan. Even now, after two decades of economic recession, Japan still pertains most of its magic in our eyes. I think, most of you have already got where I’m going. Direct application of power, naturally leading to resistance is usually associated with Hard Power. However, a more subtle approach where we influence the motivation of others without obvious manipulation is called Soft Power. Hard Power is when people do what we want them to do against their wishes; Soft Power is when people do it because they think that’s what they want themselves. So how is this relevant to our office life? A Manager has to keep a balance of Soft and Hard power in his or her approach to Office Politics. Sometimes, when standing for interests of your department versus outside threats, laying people off due to reorganization efforts or reaching a hard decision, there is no escaping utilizing Hard Power. 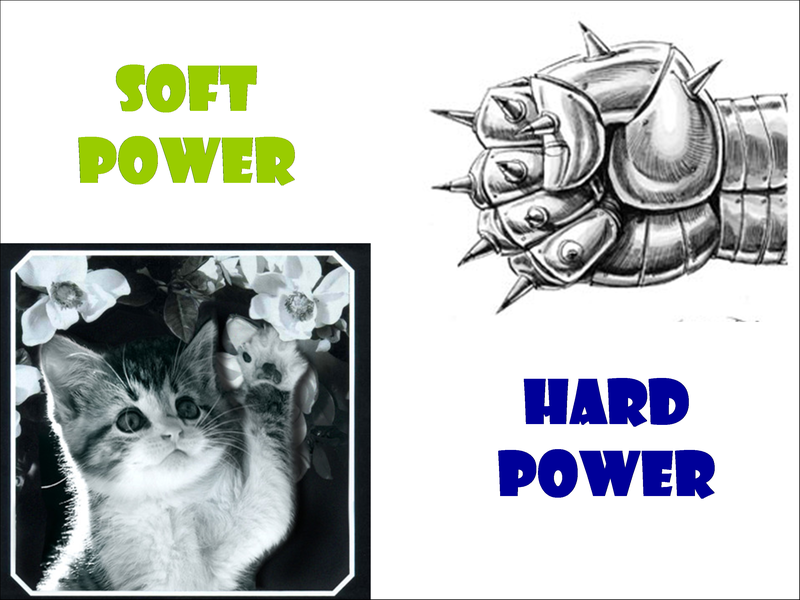 However, in many other cases, Soft Power can produce better results than your basic “Just do what I told you!” There are many possible components of Manager’s Soft power. Personal charisma, loyalty, deliberately created organization culture, team spirit, feelings of being indebted because of previous favors and perceived prospects of such favors are just some basic examples. Don’t want to engage in unnecessary conflicts? Consider applying some Soft Power. This entry was posted in Business Management, Competence Training, Conflict Management, Project Comminication Management, Project Management and tagged Communication, Competence Training, Conflict Resolution, Functional Manager, How to Deal, Human resources, Management, Team building, Workplace politics by AnyaWorkSmart. Bookmark the permalink.